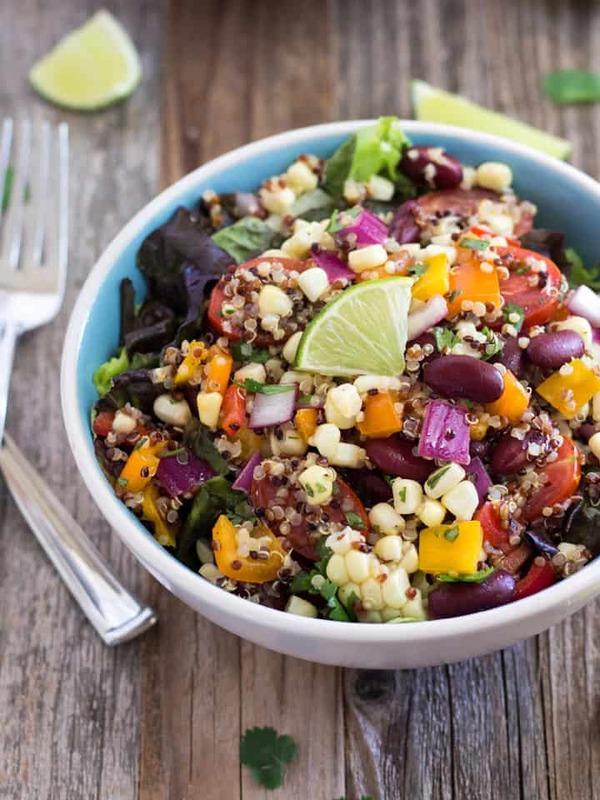 This Summer Corn and Quinoa Veggie Salad is a fresh, nutritious and light summertime meal made with sweet baked corn, crisp veggies, quinoa and kidney beans. Don’t you just love a good salad! I’m not talking about a tiny side salad with a few leaves of lettuce and one sad cherry tomato. Nope, I mean a big ole’ let’s see how many more things we can stuff into this overflowing bowl of freshness kind of salad. Around the Toaster Oven Love house we eat salad for dinner at least 3 times a week and even more during the summer months. Occasionally we go all out and make Mango Sriracha Potato Veggie Bowls. But most nights dinner is usually a Large-and-in-Charge bowl of lettuce, toaster oven baked potatoes, beans, tomatoes and a generous drizzle of sriracha vinaigrette. If you follow us on Instagram you may have caught a glimpse of that beastly salad before. While I love me a big fat “potato salad” some days a gal needs a potato break (gasp!) and something a little less…heavy. On that kind of day we like to clear the fridge. Grabbing leftover cooked grains (or in quinoa’s case cooked seeds), any random veggies, a head of crispy crunchy lettuce and throwing them together for a refreshing lighter salad. If you’ve been making lots of toaster oven baked corn on the cob this summer there’s a good chance you have a few extra ears in the fridge. If they haven’t been cooked yet, toss that corn in the toaster oven. 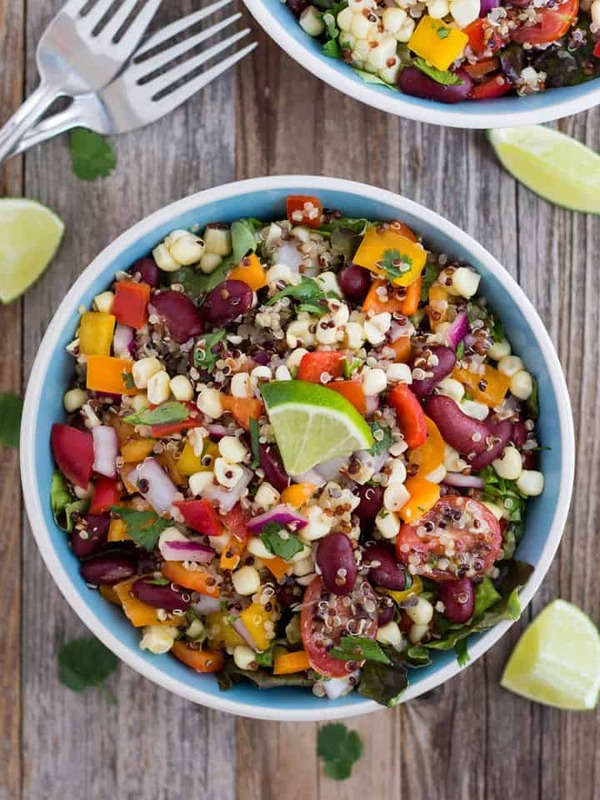 Those slow baked sweet and juicy corn kernels will add a touch of summer to every salad bite! Then whisk together olive oil, vinegar, lime juice and a few seasonings. 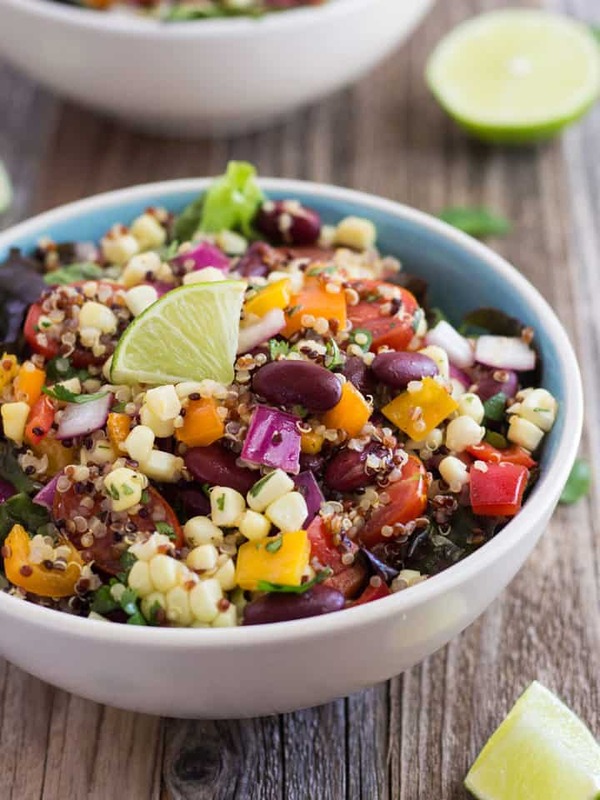 Lastly, bring all those tasty ingredients together in a large bowl for a flavorful mishmash of seasonal vegetables and quality proteins we call Summer Corn and Quinoa Veggie Salad. This salad recipe is super flexible so substitute and make additions with abandon. I’m talking add chopped avocado, cheese or nuts. Use chickpeas for the kidney beans, cooked couscous instead of quinoa, skip the cilantro and toss in fresh basil or parsley instead. Just grab what’s in the fridge and have a little dinnertime salad making fun! 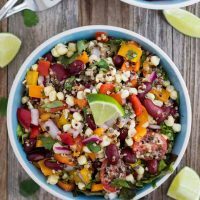 A fresh, nutritious and light summertime meal made with sweet baked corn, crisp veggies, quinoa and kidney beans. Preheat your toaster oven to 350 F. Wash and dry the outside of the corn husks. Place corn directly on your toaster oven baking rack and bake for 30 to 35 minutes. While corn bakes, in a large bowl whisk together the lime juice, oil, vinegar, cumin and a few pinches of salt and pepper. Stir in the cooked quinoa, red pepper, tomatoes, onion, cilantro and kidney beans. Once the corn is cooked allow it to cool for a few minutes, then remove the husks and silks. Cut the kernels off of the cobs and add them to the salad bowl stirring well to combine all of the ingredients. Taste the salad and adjust the seasoning (add more lime juice, oil, vinegar, salt or pepper) if needed. Just before serving stir in chopped lettuce or fill individual bowls with lettuce and top with quinoa salad. You can substitute about 1½ cups canned corn or frozen cooked corn for the freshly baked corn kernels. 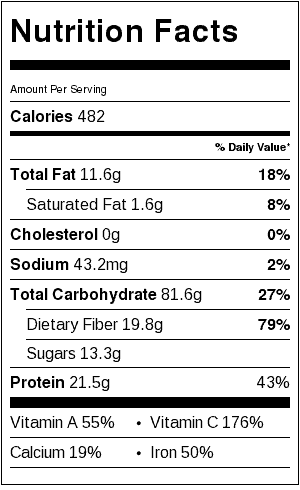 Nutritional information is an estimate for 1 of 2 large servings of salad. Grace you are hilarious 🙂 that really made me chuckle! In one of my old school cookbooks they suggest that when making a salad to mix the sliced red onion or shallots with vinegar and salt then letting it sit for 15 minutes before whisking in the rest of the vinaigrette ingredients – it’s supposed to take the bite out of the onion. Never tried it before, I like the smack you in the face style of a red onion 🙂 but next time I have company for dinner I plan to give it a go.